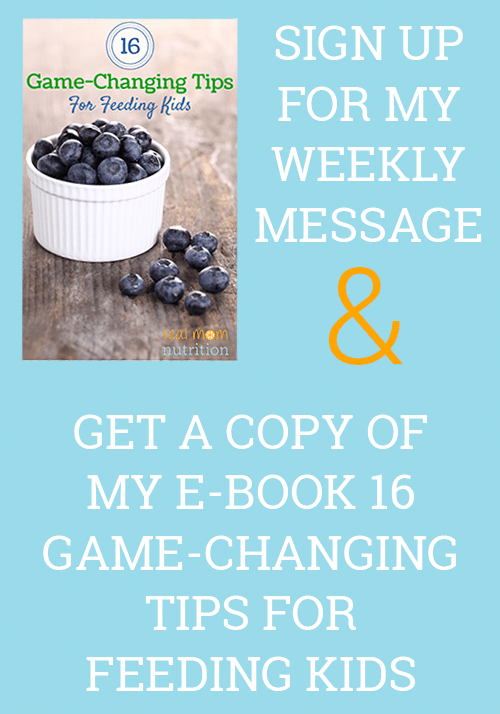 I’m writing this post in honor of Kids Eat Right Month. Teaching my older son how to cook has reminded me an awful lot of potty training him. I know, that sounds weird. But here’s why: No matter how much I encouraged and incentivized and got thisclose to pleading, it didn’t happen until he was ready. One day when he was three years old, he woke up and announced he was ready to go on the potty. And one day when he was 12 years old, I happened to bring home a kids’ cookbook from the library and he was suddenly inspired. I’ve made no secret of the fact that both of my boys had zero interest in cooking (read: The Reality Of Cooking With Kids). While everybody else’s kids on Facebook were making souffles, mine were grudgingly doing kitchen tasks only when asked and usually with an air of great inconvenience. So I sort of gave up, choosing to savor my alone time in the kitchen. I’m not sure what changed. We’ve certainly had other kids’ cookbooks. 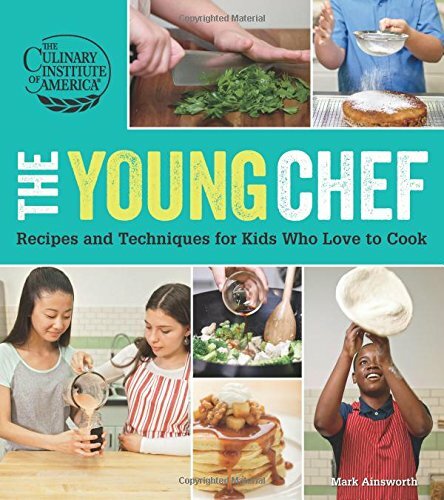 But for some reason, this one–The Young Chef by Mark Ainsworth of the Culinary Institute of America–grabbed his attention. He went through the book, marking more than two dozen recipes with post-it notes, from homemade ranch dressing to apple cake. Then he got cooking. He started with a batch of waffles (which he then arranged into a lookout tower complete with Lego stormtroopers). Then he made On-The-Go Cereal Bars and a batch of blueberry muffins. Next, a pan of Nachos Supreme. For dinner one night, he made Oven Barbecued Ribs. Then Chicken Curry another. I ordered the cookbook from Amazon and returned the library copy before it got spattered with oil and stained with sauce. 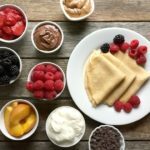 I like that this cookbook, written for kids ages 10-14, teaches the basics like from-scratch pancakes, pizza crust, sauces, and dressings plus mealtime staples like vegetarian chili, roasted potatoes, lasagna, stir-fry, and meatballs. 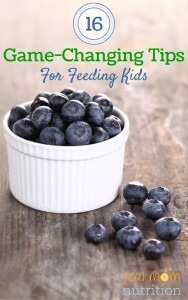 Plus, there’s info on the science of cooking, helpful tips on techniques, and boxes called “Think Like A Chef” that give kids ideas for creative variations to go beyond the recipes printed on the page. Sure, I’ve helped him along the way. He still needs assistance with jobs like draining pasta and cutting meat. But I’m trying my best not to micromanage. I’m also trying to be supportive of what he wants to make. When he wanted to make Chex Mix, we drove to the store and bought the ingredients. 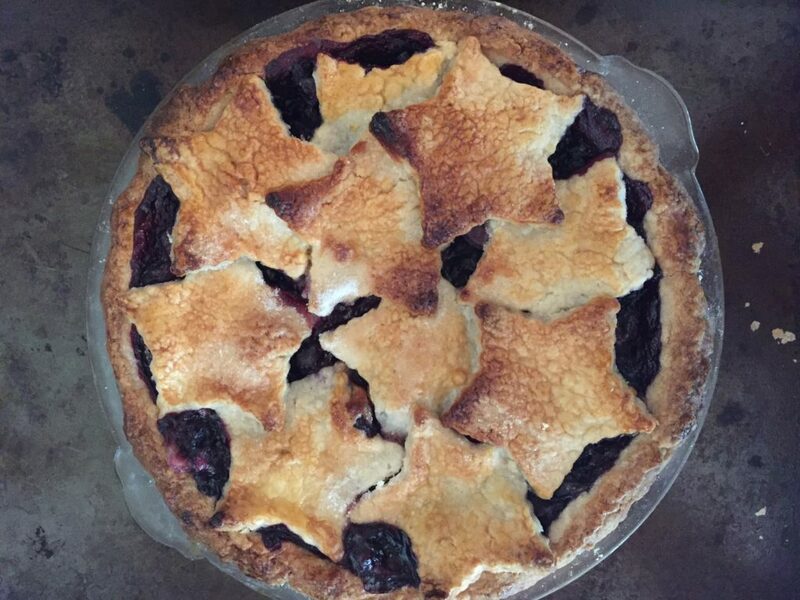 When he asked if I could teach him how to make a blueberry pie, I did. I hope his enthusiasm isn’t just a phase. But whatever it is, I’ll take it and run with it. Because my goal is that both of my kids will leave the house knowing how to cook for themselves and not have to rely on packaged food for nourishment. 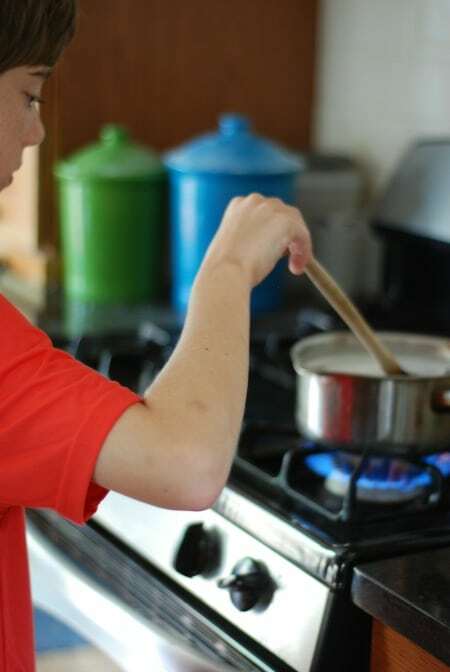 So if your kids aren’t enthusiastic about being in the kitchen, be patient. After all, despite your worries, they didn’t go off to kindergarten wearing diapers. And they won’t go off to college not knowing how to make a decent plate of pasta either. Disclosure: This page contains Amazon Affiliate links. If you purchase a product through these links, your cost will be the same but I will receive a small commission to help with operating costs of this blog. Thanks for your support! 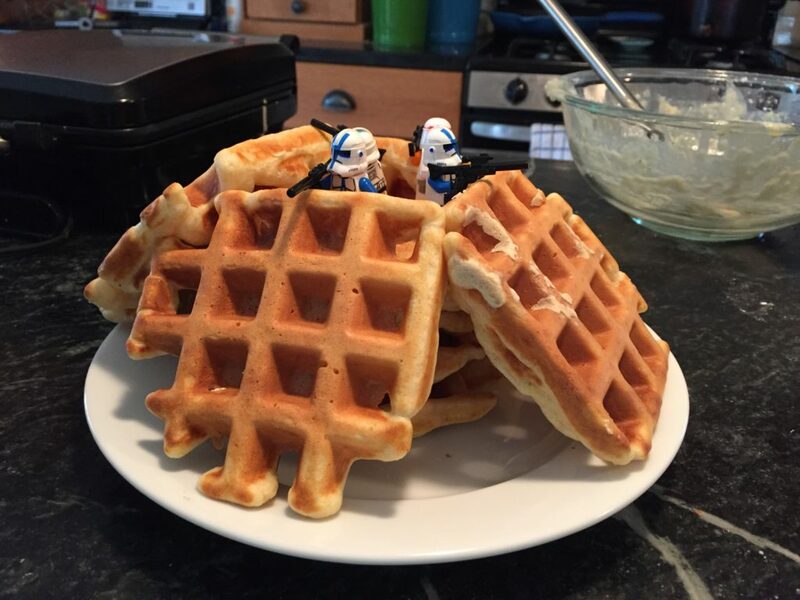 Sally – I just love how you keep it “real!” I love that the waffles became a fort for storm troopers. That’s awesome. I find I have better luck when we include Cars or Angelina in the kitchen too. Hey, I’ll do whatever it takes to keep her interested, even if it means wearing a crown and talking in a British accent. Bravo Sally! Thanks Sara. Really appreciate it. And I very much think you should post a video on your blog of you wearing a crown and talking in a British accent while cooking! Great post Sally! I love that waffle tower, I can imagine if my hubs ever made waffles, it would most certainly be surrounded by transformers or something lol! 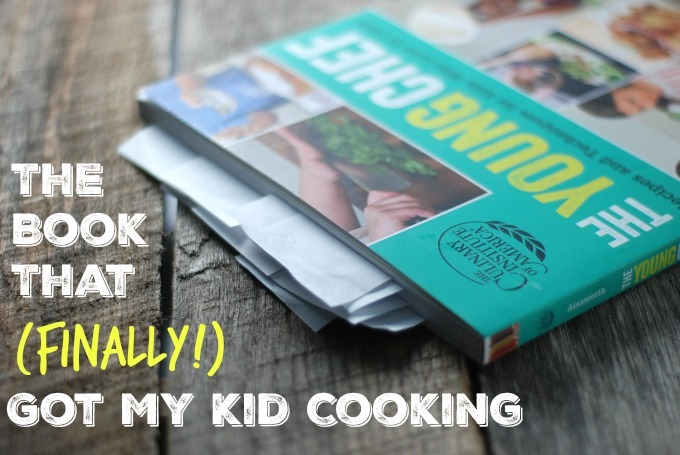 Awesome reminders here for parents and kids, I can’t wait to one day have a little sous chef in the kitchen! I love everything about this post right down to the waffle tower. I was searching for your pizza crust recipe and stumbled on this old post! I don’t think I bought this book because of you (maybe I did?) but this post is spot on! And this book is great – I love the Think Like a Chef part because we always treat his creations like a Chopped episode and discuss how it could be even better next time.